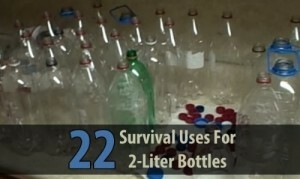 Of all the things preppers shouldn’t throw away, probably the most useful is the 2-liter bottle. Some people discard these almost everyday, which is a shame considering all the things you can do with them. If you’ve been drinking canned soda, it’s time to switch to 2-liters (it’s cheaper, anyway). And if you don’t drink soda, you probably have friends or relatives who do. Offer to take those empty bottles off their hands (just ignore the looks they give you). Maybe you think I’m exaggerating the usefulness of 2-liters. Well, see for yourself. Here’s a list of survival uses for 2-liter bottles. 1. Store Water – A 2-liter bottle makes a convenient water storage container that easily fits on pantry shelves or under beds. Fill it with warm soapy water, shake it up, then rinse it thoroughly. Next, fill it with drinking water and add about 4 drops of unscented bleach. Wait thirty minutes then smell the water. If there isn’t at least a hint of chlorine, repeat the process. Also remember that plastic breathes so don’t store these bottles next to gasoline, household cleaners, or any other liquid you wouldn’t want in your water. Finally, put the date on the side with a marker or label and replace them 6 months to a year later. 2. Filter Water – In addition to a 2-liter bottle, you’ll also need sand, charcoal, grass, and rocks (small, medium, and large) to make a water filter. 3. Purify Water – Fill your 2-liters with water, then place them on a hard surface in direct sunlight for an entire day (two days if it’s cloudy). The UV rays will kill any microorganisms in the water, making it safe to drink. However, the bottles must be made of clear plastic, the water must be fairly clear, and you need to be no more than 35 degrees above or below the equator. So if you live in the United States, this only works in the south. 4. Gather Food – A 2-liter bottle could be a convenient way to gather wild edibles such as herbs and berries. When you have enough, you can put the cap back on and ensure the edibles stay dry on your way back to camp. 5. Make a Funnel – To do this, simply cut off the top of the bottle where the curved part begins and you have yourself a funnel. This could be useful for filling other bottles with food or water. 6. Make a Scoop – Instead of cutting the bottle straight across, cut it at an angle just below the curved part. Leave the cap on, and you’ll have a scoop you can use for food, water, dirt, or whatever else you need to scoop. 7. Store Food – First you’ll need to wash them out thoroughly and make sure they’re 100% dry. Setting them upright with the cap off in direct sunlight for a while should do it. When they’re ready, use your funnel to pour food into the bottle. When it’s almost full, top it off with a 300cc oxygen absorber and screw the cap on really tight. And as with storing water, make sure you don’t store your food next to anything toxic. 8. Keep Food Cold – If your freezer isn’t completely full, you should fill some plastic bottles with water and use them to fill in the empty spaces. Just leave a few inches at the top of the bottle so the water has room to expand as it freezes. By doing this, you’ll make your freezer food take a lot longer to thaw if the power goes out. You could also grab a few of these ice bottles and use them in a cooler. And when the ice melts, you can open the bottle and drink it (if you plan on doing this, make sure the bottle is clean before you fill it). 9. Make a Bowl – For this, just cut off the bottom of the bottle. Where exactly you cut it depends on how deep you want the bowl to be. Since the plastic is thin, I wouldn’t recommend using it for hot soup. 10. Make a Spoon – Now that you have a bowl, you probably need a spoon. 2-liter bottles have five bumps on the bottom. What you can do is get a bottle and cut out the shape of a spoon, using one of those bumps as the bowl of the spoon. 11. Make a Capsule – Cut the tops off of two bottles, use a file to smooth down the saw marks, and super glue them together with the caps facing outward. Now you have a tiny capsule that can hold pills, seeds, jewels, and other small valuables. 12. Start Seeds – 2 liter bottles are perfect for getting seeds started. Cut the bottle in half, poke some drainage holes in the bottom, add some potting soil and water, then plant your seeds. To help the seeds germinate, you can place the top half over the bottom to create a greenhouse effect. 13. Grow Plants – There are several ways you can use 2-liter bottles for plants, but one of the most interesting is the self-watering pot. You cut the bottle in half, put some water in the bottom, turn the top upside down and fill it with soil, and place it in the bottom part. Then, several pieces of strings going through the cap act as wicks, drawing water from the basin into the soil. 14. Water Plants – You can also use 2-liter bottles to make a drip irrigation system. Cut off the bottom of the bottle and discard it, poke some holes in the cap, then turn the top of the bottle upside down and half-bury it next to your plants. Fill it with water and refill as needed. 15. Make a Hanging Planter – Here’s an idea that’s great for plants like tomatoes and peppers. You cut the bottle in half, turn it upside down, fill it with soil, and hang it up. The plant grows out the bottom where the cap was. Of course, it’s a little more complicated than that. 16. Catch Bugs – There are several ways to do this as well. If you just want to catch those annoying flies, all you need to do is fill your bottle halfway with water, drop a piece of raw meat in there, and poke a few holes near the top. The flies will crawl in after the meat and get trapped. Eventually they will drown in the water. For other mosquitoes, you’ll need a different kind of bait and a slightly more complicated trap. Try jam dissolved in water for wasps, and orange juice for fruit flies. 17. Catch Fish – Cut off the top of a 2 liter bottle, turn it over and place it in the bottom, then poke some holes and tie them together with some string. Place the trap in a stream, and minnows will swim inside and not be able to find their way back out. 18. Stay Afloat – If you need to cross a river or something don’t think you can swim that far, put a bunch of sealed bottles into a bag or tie them all together and use it as a flotation device. If you have plenty of bottles and you’re feeling ambitious, you could even build a small raft. 19. Make Sandals – You’ll probably never have to do this, but if you’re stuck outdoors with no shoes you can make a pair of sandals using two bottles, some cordage, and duct tape. 20. Make a Broom – Having a clean floor isn’t really a matter of survival, but this is too creative not to mention. Basically, you cut the bottom half of the bottle to shreds and attach it to a long stick. There’s a little more to it , though. I haven’t tried this one myself, but it looks like it would work well enough. 21. Make a Faucet – If water is in short supply but you need to rinse off your hands or something else, you can use a 2-liter full of water as a faucet. Just hang the bottle upside down over a sink or bowl, then slowly unscrew the cap until a thin stream of water pours out. Tighten the cap again when you’re done. Bonus tip: Paint the bottle black and hang it in direct sunlight so you can have warm water. 22. Make a Light – Fill a bottle with water and a few drops of bleach (to prevent algae growth) and stick it in a hole in the roof of your shelter. Sunlight will hit the top of the bottle, and the water will disperse the light throughout your shelter. It works surprisingly well (as good as a 40 watt bulb). 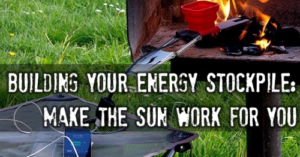 In fact, there’s a movement aimed at bringing this idea to communities without electricity. These steps will make it easier to fight off bacteria, parasites and disease when disaster strikes! While keeping clean may not be glamorous, no amount of firepower, clothing, doomsday shelters or military tactics can overcome the problems poor sanitation causes. Be clean, stay clean and keep clean should be staples in your day-to-day habits while you’re in survival mode. According to the Centers for Disease Control and Prevention (CDC), cleaning up, disinfecting and practicing good hygiene will go a long way in avoiding illnesses from bacteria, viruses, mold and mildew. When you’re in survival mode, you need every edge you can get, and being sick, whether it’s from a cold, contaminated water or spoiled food, can spell the difference between being alive and being a statistic. The CDC says one of the most important things you can and should do is to wash your hands, especially during the end of the world. What you touch, whether it’s a person, beast or structure, will most likely be compromised with something bad. Particularly dangerous examples include E. coli bacteria and the West Nile Virus. Washing your dishes and keeping your tools and shelter clean all matter when it comes to staying healthy. As with any survival situation, circumstances dictate just how tough things might be. Warm water and soap are lifesavers when you can safely use them. Moist baby wipes in your bug-out bag, camper’s soap, hand sanitizer and foot powder are all things you should check (and double check) in your essential gear. An often-overlooked aspect of personal hygiene is dental care. Bad breath is not the worst thing that can happen to you after a few days of not brushing your teeth. The bacteria from inflammation of the gums and periodontal disease can enter your bloodstream and travel to the arteries in the heart and cause atherosclerosis (hardening of the arteries). Atherosclerosis causes plaque to develop on the inner walls of arteries, which thicken. This subsequently decreases or blocks blood flow through the body, causing an increased risk of heart attack or stroke. The Journal of Periodontology warns that gum disease could cause you to get infections in your lungs, including pneumonia. While the connection might not be completely obvious at first, think of what might happen from breathing in bacteria from infected teeth and gums over a long period of time. Inflammation of the gum tissue and periodontal disease can also make it harder to control your blood sugar, making your diabetes symptoms worse. Diabetes sufferers are also more susceptible to periodontal disease, making proper dental care even more important for those with this disease. You need to stay clean both on your body and with the clothes you live in day-in and day-out. Another problem here is making sure your water is clean. Several aftermarket water filtration systems like the Platypus GravityWorks water filter system are available. This 4-liter system physically removes particles, protozoa and bacteria down to 0.2 microns in size, and more. Keeping your food stores clean goes a long way toward keeping you clean and ultimately alive. First things first: Make sure you wash your hands, your tools and your food religiously, before and after you use them. Hot soapy water works on most things and bleach can be used on clean surfaces and cutting boards. When you have raw foods like chicken or wild game, be sure you don’t cross contaminate other ready-to-eat foods. The CDC recommends using a food thermometer. Make sure food reaches its safe minimum cooking temperature. For example, internal temperatures should be 145 degrees Fahrenheit for whole meats, 160 degrees for ground meats and 165 degrees for all poultry. Eggs should be cooked until the yolk is firm. During meal times, while food is being served and eaten, try to keep it hot—preferably at 140 degrees or above. Trash is no treasure for anyone in a survival situation. Disease, odor, rodents, rats, fleas and other vermin feast on our trash. For the most part, the best thing to do in a survival situation is to bury your waste, but in a manner that doesn’t contaminate your water supply or lead to a weakened tactical position. When conventional bathroom facilities aren’t readily available or safe to use, a “cat hole,” which should be about a foot wide and a foot deep, can be created for human waste disposal. The key is to bury the waste completely. When tactical situations allow for it, burning waste can be useful as well, however, great care should be used because of the lingering odor, and the sure give-away of your location with the smoke from the fire. There are all kinds of critters in the world ready to feast on your bad day. Ticks, mosquitos, ants, fleas and other pests are ready, willing and able to add misery to your survival efforts with irritating bites, disease and compromising situations. The U.S. Army suggests that the best strategy for defense against insects and other disease-bearing arthropods is use of the DOD Insect Repellent System, which is the application of extended-duration 33-percent DEET repellent to exposed skin, the application of permethrin to the field uniform and a properly worn uniform. So, use DEET, treat your clothes with permethrin and cover your body with long-sleeve shirts, socks, long pants, hats, gloves and other suitable clothing to minimize your exposure to bugs and other parasites. The bottom line in field sanitation, whether it’s you alone or a survival party, is to be clean, keep clean and stay clean. Plan accordingly in this endeavor to strength your survival strategy. 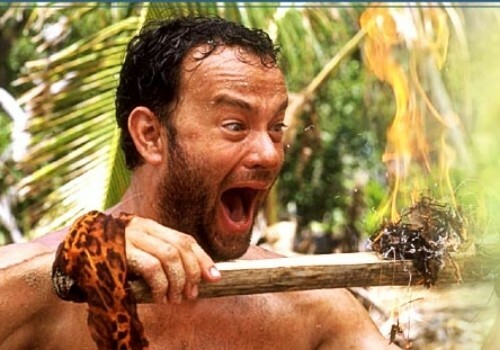 The Most Common SHTF Injuries and How to Treat Them! No one wants to think about having an injury in a situation where you can’t get to a hospital or a doctor, but it happens more than you might guess. When you are making your preps for a SHTF scenario, one of the most crucial items for you to stock (and stock well) will be your emergency medical kit. This kit could be the very piece of equipment that saves your life. You should also consider taking a first aid and lifesaving course as part of your preparations, too. Knowledge combined with the right tools (or knowing how to use (or make!) an alternative is a powerful tool! It’s also a good idea to purchase a medical handbook to keep in your emergency kit as a reference guide. You should know how to recognize and treat all kinds of injuries from insect bites to burns, since you never know what might come your way. Burns can come from fire, from chemicals, or even from too much sun. Each type can vary in severity depending on how long you were exposed. With any type of burn, the first and most important thing you can do is cool it down. Apply cool water constantly (sometimes it might take an hour or so) to lower the temperature of the burned area. You can give over the counter pain medication, and apply aloe vera gel to the area, but you need to keep the burned area dry to help avoid it getting infected. You could use sections of a clean t-shirt, a dry cotton washcloth, or a bandana as a covering to keep dirt out, but it also needs time to air as well, so that moisture doesn’t set in. If you don’t have any supplies with you, locate some clean water, and tear up strips of your own shirt to use as dressings if you have to. Keeping infection at bay is crucial. This is another common survival injury, and like burns, the best thing to do is keep them clean and dry. For a scrapes and minor cuts, simply rinse the area well, and clear any visible debris from the wound. Then if you have some antibacterial spray or ointment, apply to the area, and cover with a dry bandage. If you have a deep cut or laceration, you need to clean the area, apply pressure to stop the bleeding, and possibly use a suture kit or some wound glue to close it. Then it needs to also have antibacterial/antibiotic cream applied, and a clean bandage applied several times a day. If you don’t have your kit with you, keeping it cleaned well with water and pressure applied is going to be your best course of action. Treating a broken bone or a sprain yourself doesn’t have to be hard. Using ACE bandages, padding, and a splint, you can stabilize a broken bone fairly easily. The main goals are to keep swelling down and keep the injured area from moving around very much. You can ice the area, too, using cold packs, snow, or ice, and then bandage/splint it. You can get some splints in varying sizes for your emergency kit at most drug stores or medical supply stores. If you don’t have access to any of these items, you could use sticks as a splint, and cut up t-shirts as bandages, but also use something to pad the injured area, too. Sprains will usually heal up on their own with some time and limiting movement. Bone breaks are a little trickier, but you can get them stabilized enough to buy you some time until you can get to a doctor. You don’t have to be scared to treat injuries without a doctor. In fact, it should be one of the most important skills you learn as you prep for a disaster. Part of the advice in these two videos is clearly questionable, but there are also some good points. Technically, in 25 minutes you can learn a lot of stuff just by watching the videos. Enjoy! Any gathering of people can be a potential target for someone or some group. This is nothing new however. Attacks at gatherings have happened for centuries, and they will continue to happen. Mass casualties are the intention, so when people are grouped together it takes less effort and little training to inflict injury and to cause fatalities. Shooting into a crowd of people requires no training to kill a number of people in the crowd. It only requires the mindset needed to pull the trigger. The definition of terrorism is to use violence and threats to intimidate or to coerce others, particularly for political purposes. Staying home huddled in fear is not an option. If you are forced to change, because of a threat or a perceived threat then you have been coerced, and you now have lost a certain amount of freedom, but then again survival is the objective. The so-called lone wolf attack is the hardest one to guard against, because a person can have intentions that are not disclosed or obvious to anyone, and if they are, it is usually to sympathizers that only encourage the behavior and not deter it. In some cases, there is no trail to pick up, so to speak. This person can show up at any event with a firearm concealed on their person and open fire. They can use a vehicle as a weapon or use explosives. You have all heard the term, but how many of you practice it. Early humans literally had to guard against predators lurking at the entrances of their shelters. A foraging expedition or a trip to the river for water was fraught with dangers from other humans and four legged predators. Humans for centuries were conditioned to scan the trees, the darkened woods and to check the shadows for danger. A weapon was always at hand, and no one became so engrossed in his or her tasks that they did not look up continually to check their surroundings. They knew which way to bolt if the chance presented itself and if not they stood and met the threat head on. They had a plan. If you hear gunshots do you run toward them or away from them? If you do not have a weapon and are not trained to counter an attack then you run from the sound of gunfire, otherwise you may lose your life. You literally herd your friends and family away from the sounds. You need to know where the exits are, what objects can offer cover (protection from rounds), and you need to know what can conceal you from an attackers’ view. Cover and conceal. You need to always look for avenues of escape no matter where you are. 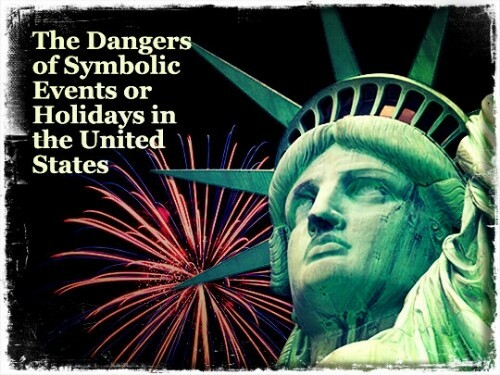 Do you know what a gunshot sounds like, or will you confuse it with fireworks, it would be easy to pass off explosions and loud bangs as fireworks. Stay out of the middle of the crowd and if you hear what may be gunshots look for people running, and if the crowd begins to move or panic then you have to move quickly, more quickly than the crowd. You should never let yourself get caught in the middle of any crowd. Once an attack starts those around you will panic and impeded your movements, and in some cases, if you fall you could be trampled to death. People trapped in a burning building will pile up at blocked exits and can suffocate or trample people around them. Crowds are dangerous for this very reason. They impeded your escape and they can kill you. Alcohol makes you an easy target and when celebrating in public when there is a large gathering you need your wits for any number of reasons. Becoming drunk in public makes you a target for literally anyone, because you may think you can deter someone but you cannot. Soft targets are typically those not guarded well or at all, and so they make easy targets. Attackers do not want to be fired upon. They do not want anything to slow or to stop their carnage, so they will choose targets that they suspect or know will not be guarded well, such as malls, outdoor markets, parades, parties, and any gathering in a public place. If you have to leave in a hurry do you know which way to go and if the first avenue is blocked do you have an alternative route mapped in your head. This is the world we all live in today, and we all have to pay attention to what is happening in our immediate area, and around the world so we can do threat assessments. Enjoy life, enjoy celebrations, but always have an eye to the trees, to the shadows and always have an escape route mapped out in your head. Consider the “what ifs” at all times. OK, so you’re a little annoyed whenever you buy new preps because some cashiers have clever remarks as to the quantity of food you’re getting and… you find yourself in need of some clever answers. Before we begin, just remember cashiers are people like you and me and they’re just making small talk, nothing more. So don’t act or be paranoid, you’ve got other people interested in your preps besides them. Or you can just say “yeah” and leave it at that. if you’re not gonna say anything, they might think you’re prepping but who cares? At least it won’t bother you that much because you ended everything before it began. …with my whole family. Which you probably should, anyway. 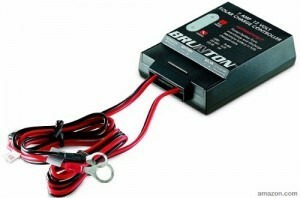 No one can deny that a lot of the stuff you’d buy for stockpiling purposes would be useful when camping. It’s a good excuse and most people will buy it. That could mean up to 20 or even 30 people! Of course, this won’t work if you’re getting canned food, MREs or freeze dried. It does work when you’re stocking up on beans, rice, water, pasta, salmon, cooking oil, spices, baking soda, vinegar, tea and coffee. You want to say it sarcastically because then you’re sure they won’t believe you. On the other hand, if you truly don’t care of what others say and think, you probably don’t need to read this article at all. Of course, you don’t NEED to say this word by word. It doesn’t matter how you phrase it as long as you come across congruent. When you give one word answers, the other person just… gives up. Just be careful with these. Don’t use the ones that are too cocky unless the cashier is open and friendly, otherwise they’ll end up remembering you, the thing you were trying to avoid all along! The whole idea about buying preps is to become gray and one of the ways you do that is by not standing out too much (or at all). And humor is a good way to do that, by the way. Well, it is believable, I guess. Cashiers aren’t supposed to be smart-asses so they’re not gonna say anything back. In fact, there’s nothing wrong with shopping every 3-4 weeks. You don’t have to say you hate it, you can just say it salves time. You can go on and say that it’s always smart to have a well-stocked pantry since food prices are rising and packages are getting smaller. Plus, you can let them know that these foods have a very high shelf life, just to subtly assure them everything’s normal. Another good comeback which works better when you’re not lying. If you really do have a hunting or a fishing cabin, you should definitely use this comeback. And you should lodge it stocked up, too, you might end up bugging out there. Are they gonna come home with you to find out? Nope. A fantastic way to avoid answering too many questions is to start asking questions yourself. This way, the cashier will end up talk more than you and forget all about how much you’re buying. Yeah, I’m not sure which one is better, though, white or brown? White is tastier and has longer shelf life but brown is healthier. And you take it from there. Well, it can happen that a restaurant runs out of food and needs a few quick supplies, right? Another way of looking at it is that SHTF in that restaurant but you probably don’t want to mention this to the cashier. Not really but I found that the less arguments, the more peaceful I feel. Even when you don’t want to admit it, other people’s words, can get to you so the less you hear the better. Last but not least, don’t forget that a cashier’s job is also to be friendly and make small talk. In the vast majority of cases, they won’t even remember what you told them after two minutes. They make small talk just to be polite and someone buying too much of one thing is always a good excuse. How can you completely avoid these remarks? Packing a bug out bag is tough, as if you plan to travel long distances, you’ll want to keep your bag as light as possible (consider adding pannier to your bike for additional food and water storage). But what is one must-have that has several uses, and even provides a little bit of creature comfort? 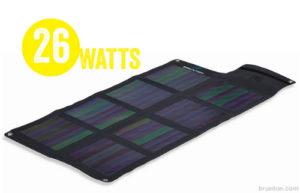 I use a microfiber towel when camping or backpacking abroad, and it’s been a life-saver. Packing a towel sounds cumbersome, but hear me out — these towels are a fraction of the weight of your standard bath towels, and they have several uses in a survival scenario. 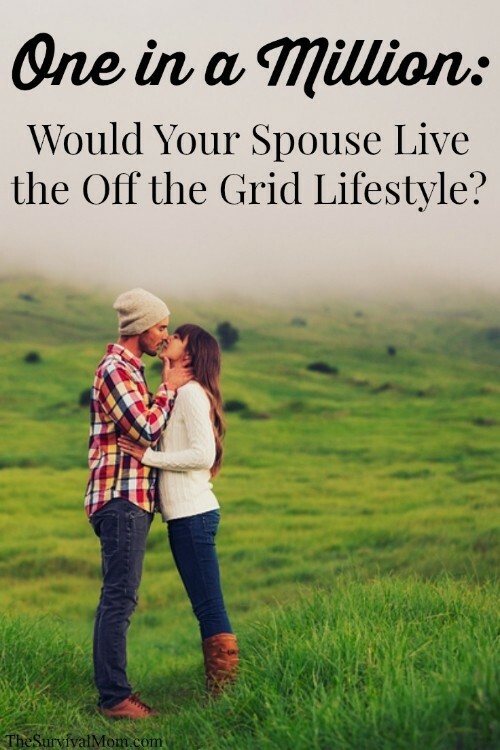 It’s a little piece of comfort of home life before SHTF, which may help your morale. There are several different options for microfiber towels available at various camping stores, but as always, Amazon seems to come out on top with the best pricing — a quality microfiber towel on Amazon costs around $20-$30. How many microfiber towels do you need? These are questions you’ll best know the answer to: How many people are in your family? Will you be bugging out in a warm climate? You may be able to get away with 2-3. If you’ll be bugging out anywhere that experiences cold weather and freeze warnings, one towel per person can help as an additional light layer. 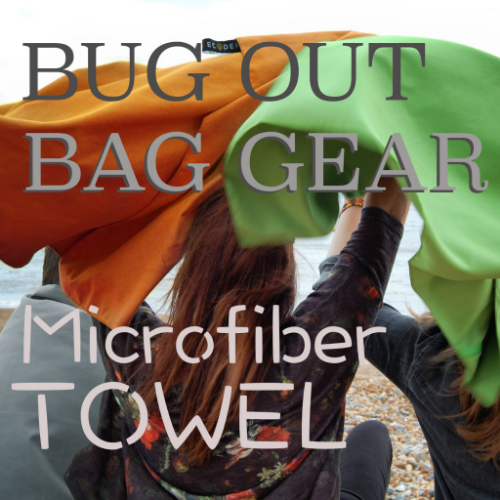 Is a microfiber towel on your bug out bag packing list? How To Get Your Spouse On Board with Prepping. Getting your spouse onboard with prepping can be a huge challenge for the best of us. I know that when I first told my wife that we needed to start prepping, she looked at me like she thought I had been in the sun too long. It was more of a look of pity than anything and I kept expecting her to say “Bless your heart!” (That is southern for you poor fool!). I knew right then that I had my work cut out for me. A couple of days later she informed me that it was a real Agenda and that she would look further into other things that I talk about. All I needed to do was peak her curiosity a little to get her started looking. She still wasn’t ready to give in just yet however. Over the next couple of months I brought several other items to her attention that she at first thought was just the ramblings of a mad Prepper. In each case I had her research them (She is good at that!) and lo and behold, they were real. She had a hard time believing that our Government would stand by and let things like that happen. Let alone condone it. By this time, she was off and running, I had created a Monster! She was reading everything she could get her hands on ….when she wasn’t playing games on the computer that is. I guess that the reason that I am telling you this is so you can see that most people who don’t believe in prepping are not stupid, they just haven’t opened their eyes to the truth. It is just easier for people to believe that everything is well and right in the world than to face the truth and know that dark and scary world that we live in. It’s like looking at the Sun, it hurts! Sometimes it may take several fact check items to get them to open their eyes. You just have to be willing to be patient and let them convince their own selves that what you are saying is true. Whatever you do, never say I told you so! IF you do then you will probably lose them and they will not admit you are right no matter what you say. No one likes to be proven wrong, so use that to get them to start looking into things that they normally wouldn’t look into. You may want to point to the first Amendment and how Washington is creating “Areas” of free speech and how they are now also creating areas where it is not allowed. Then point to the second Amendment and how they are working to make laws to take away our right to keep and bear arms, even though that right is guaranteed to us by the Bill of Rights. Then start asking why she thinks they are working so hard to take them away from us? If she says that guns kill people, then show her the facts and that they are actually one of the least deadly weapons used to commit murders. Get the facts and show them to her or him whichever the case may be. This may work for you and then again it may not. It all depends on how much they are determined to keep their eyes closed. I know that it has worked for me and many others that have faced the same challenges. If you can ever get them to open their eyes and see what is actually out there then you have a chance. Facing a horrible truth is a scary thing and you must be patient when dealing with them. Do it gently and slowly and soon you will be prepping together. Good luck and remember that prepping is not a destination but a journey and one that should be shared with your spouse. A word of WARNING: Pick the subject that you want them to look into carefully and be sure that they are true before you have them follow-up on them. There is a lot of debate on whether Wednesday’s computer issues that shut down the New York Stock Exchange, the Wall Street Journal, and United Airlines were just a very strange coincidence (very strange) or a deliberate cyber attack. Regardless of the origin of the so-called computer “glitches” that shut down Wall Street and a major airline, the events of Wednesday gave us just a tiny glimpse at how serious a cyber attack could be. What exactly is a cyber attack? Cyber attacks happen far more frequently than you might think. How does a cyber attack affect you? You may think that if you don’t spend your day working online, that an attack on our computer infrastructure isn’t that big of a deal. You may feel like it wouldn’t affect you at all. Unfortunately, there are very few people in the country that would remain completely unaffected in the event of a major cyber attack. Our economy, our utility grids, and our transportation systems are all heavily reliant upon computers. This makes us very vulnerable to such an attack. And by vulnerable, I mean that if it was done on a big enough scale, it could essentially paralyze the entire country. Here are some of the systems that are reliant on computers. In the event of a widespread cyber attack, the following could be either completely inoperable or breached. Keep in mind that a domino effect could occur that effects systems beyond the original target. Banks (all of the records are online) would not be able to process electronic transactions. ATM machines would not function to allow customers access to cash. Traffic management systems like stoplights, crosswalks, etc. Everyday trade – most business have a computerized cash register that communicates directly with banks. Many business are also reliant on scanning bar codes for inventory control and pricing. Point-of-sale systems would be down and people would not be able to pay using credit or debit cards. Telecommunications systems can be affected if cell towers are disabled or if the landline system were directly attacked. As more people rely on VOIP, taking down internet service would serve a dual purpose. SMART systems could be shut down or manipulated. All of those gadgets that automate climate control, use of utilities, or appliances through SMART technology are vulnerable. Here’s a video from NATO that explains a little bit more about the dangers of cyber attacks. Prepping for a cyber attack is not that different from prepping for other types of disasters that affect the grid. You want to be able to operate independently of public utilities, stores, or public transportation. Click each item to learn more details. Have a supply of water stored in case municipal supplies are tainted or shut down. Be prepared for an extended power outage. Have a food supply on hand, as well as a way to prepare your food without the grid. Keep cash in small denominations on hand in the event that credit cars, debit cards, and ATMs are inoperable. Keep vehicles above half way full of fuel, and store extra gasoline. Be prepared for off-grid sanitation needs. Invest in some communications devices like ham radio or other options available. 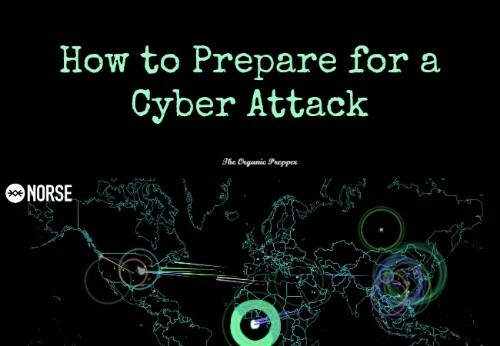 Be ready to hunker down at home to avoid the chaos that could come in the aftermath of a massive cyber attack. Always be prepared to defend your home if necessary. Remember that your prepper supplies and skills will see you through this disaster. Protect your identity with a service like LifeLock (which will alert you to suspicious activity once things return to normal). Use some of these tips to keep your information locked down.